Paw Print Genetics customers can now receive Clear by Parentage certificates for their puppies. Responsible breeders work hard to ensure that their dogs are clear of inherited diseases found in their breed. Breeders also want the ability to show potential buyers that the puppy they are about to purchase is also clear of disease, but testing an entire litter can be expensive. Our new Clear by Parentage certificate program provides breeders with an alternative to testing their entire litter. Breeders can now clear their puppies for the diseases already found clear in the dam and sire. This program is for those breeders that used Paw Print Genetics for their disease testing. Follow these easy steps to get your certificates. Order and complete disease testing on prospective parents through Paw Print Genetics. Once pups are born, do parentage testing through Paw Print Genetics using the parents and any pup for which you want a certificate. When the parentage has been completed proving the parents, order Clear by Parentage certificates for those tests that are clear in both parents. In some cases, one or both of the parents are carriers of a genetic mutation. 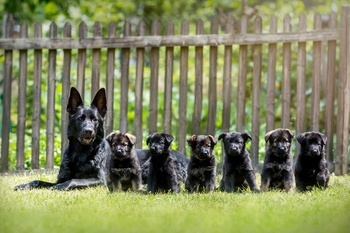 Breeders can order testing on one or more pups for any other disease, trait or color test in which they want to know carrier status using the same DNA that was used for parentage. For those tests, a Paw Print Genetics report and Canine Genetic Health Certificate will be issued. Samples that can be used for parentage and disease testing include umbilical cords, dew claws, blood samples, cheek swabs and in some breeds, docked tails. The cost of disease testing varies by order. Parentage testing is $30 per dam and each potential sire and $30 per pup. The parentage testing results can be used again for any future litter at no additional charge. Thus, for future breedings with either the dam or sire, you would pay only $30 per pup and $30 for a new dam or sire. Once the parentage is completed and parents proven, Clear by Parentage certificates can then be ordered for $19 per pup. The certificate will show all diseases for which both parents are clear (normal). You pay only $19 per certificate, not per test. Please note that both the disease testing and the parentage testing must be conducted by Paw Print Genetics for Clear by Parentage certificates to be issued. No other laboratory meets our quality standards of performing each mutation region twice, with two independent methods. Therefore, we do not accept testing results from other laboratories. If you have any questions about our Clear by Parentage certificate program or questions about any of our testing, please contact us and speak to one of our customer care specialists or go straight to the top and discuss your concerns with one of our laboratory directors. Our geneticists and veterinarians are here to help make sure that you understand your testing and that we meet your needs as a breeder. **Note: It is the customer’s responsibility to check with their breed club, registry or OFA prior to ordering Clear by Parentage testing to confirm that their registry will accept Clear by Parentage results from Paw Print Genetics. This is very exciting and I look forward to having Healthy, health tested Babies In the future.